AMMONNEWS - Egypt on Saturday announced the discovery of a collection of Ptolemaic burial chambers containing a large number of mummies, in Minya, south of Cairo. 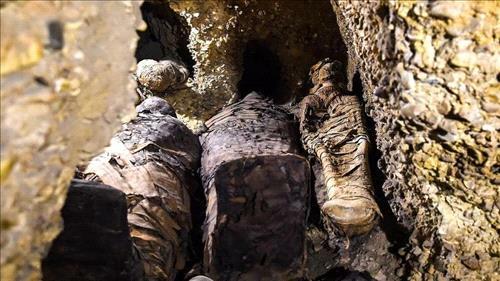 Antiquities Minister Khaled el-Anany revealed that the first discovery of 2019 included at least 40 mummies, of which ten are thought to belong to children - the rest are adult men and women of different ages. According to el-Anany, the newly discovered tombs are all in good conservation, and likely a family grave of members of Egypt’s elite middle class living during the Ptolemaic dynasty that ruled Egypt from around 320 B.C to about 30 B.C. He added that 2019 would bring more discoveries. A joint mission from the Antiquities Ministry and the Research Centre for Archaeological Studies of Minya University led to discovery at the Tuna el-Gebel archaeological site in Minya.